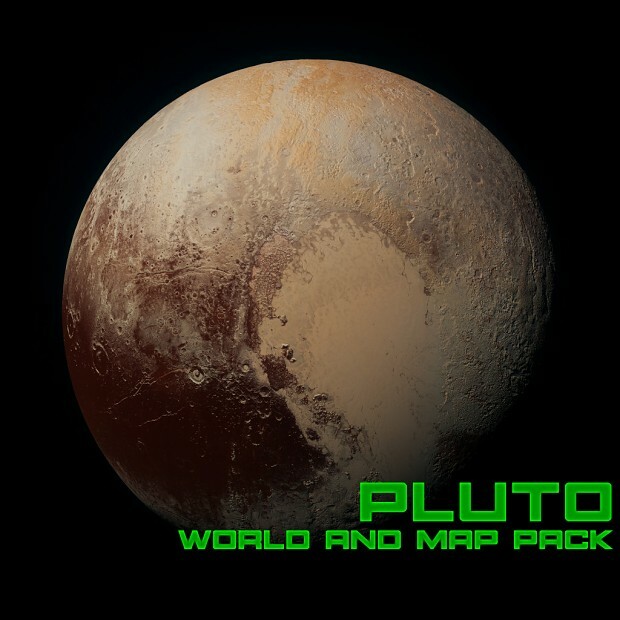 Included in this map pack are 3 maps on the distant dwarf planet of Pluto as well as support for the Pedigree Experimenal Black Dogs, a custom faction created by Scrappool who are the predecessor to BZ2's Scion Collective. The dwarf planet Pluto, a little ball of ice that skirts the inner edge of the Kuiper Belt along with its five moons. When New Horizons shot back images of the dwarf planet last year, I knew I just had to make a texture set for it. The beautiful mixture of pale ice and blood red rock is absolutely striking and I couldn't be happier with how it looks in-game. Included are three maps, all made by yours truly. This 2-player strategy map plants you and your opponent at eachother's feet, with plenty of scrap between you both. The battle will be fast and brutal, so make every second count. This 2-player strategy map is littered with small pockets of scrap and plenty of geysers. Control of the widespread scrap fields will be critically important, as will be the 3 passageways between the Northern and Southern ends of the map. In the biometal city of New Stalingrad, CCA forces have been testing new and devastating weapons with which to conquer the inner solar system. This 15 player deathmatch map is sure to be one hell of a brawl. Also included is the P-EX Black Dog faction, an elite squadron of NDF recruits enlisted for a super-soldier program run by Commander Braddock, seeking to infuse Biometal into human flesh in order to pilot specialized vehicles with terrifying new weaponry. While they are a powerhouse with sufficient biometal resources, their units are slower to build and much more costly, beating them is possible for any player aggressive enough to fight them head-on before they can bring their more powerful units into the fray. I encourage anyone interested to make their own maps and to edit my texture set as they see fit, I'll be happy just knowing my work is being enjoyed. This is the fourth world I've posted to the workshop, if you include Ganymede and Elysium which I posted prior to TROR's release. I hope to add new maps to it soon as well as update the Ceres map pack.